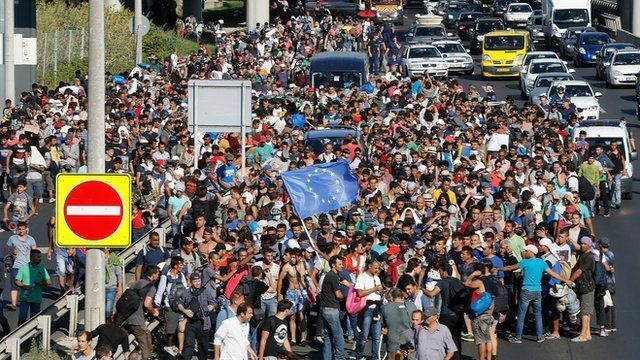 Hundreds march to Austria border Jump to media player Hundreds of migrants stuck at a Budapest railway station for days have set off on foot, saying they intend to walk to Austria. Marching migrant: 'We're off to Austria' Jump to media player Matthew Price speaks to one of hundreds of migrants who say they intend to walk to Austria from Budapest railway station. Migrant crisis 'is a German problem' Jump to media player Europe migrant crisis: Hungary's prime minister Viktor Orban says the crisis is "not a European problem, it is a German problem"
Hungarian authorities are trying to contain thousands of people desperate to reach western Europe.